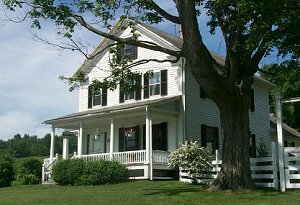 Harvest Moon is a classic 1835 Vermont bed and breakfast located in a spectacular farmland setting with outstanding views of the surrounding mountains. We have two guest rooms each with private bath and three common areas, all furnished with antiques. All rooms have wonderful detailing from the vintage wallpaper to the warm wainscoting in the dining room. Wake up to the aroma of a full Vermont country breakfast featuring all organic and vegetarian foods. Our amenities include TV/VCR (and large video library), Stereo with CD player, Vintage Library, Piano, Badminton, Ping Pong, board games, hammock, and relaxing on the wrap around porch. The Central Vermont region offers activities year round. Skiing at Killington/Pico, canoeing, swimming, biking, hiking, antiquing, and museum hopping to name a few. We accept all major credit cards. We are able to accommodate parties of up to seven. Families with small children welcome.